In less than two weeks, Occupy Oakland went from its first public action to calling for a city-wide general strike. To review: in less than two weeks, Occupy Oakland went from its first public action to calling for a city-wide general strike. That’s one hell of an escalation. In my previous life as a community organizer, our campaigns were launched with the understanding that they would be long, drawn-out affairs—weeks of door-knocking, the initial meeting, our first collective action—with the butcher paper taped to the walls measuring the progression in months. So what accounts for the breathtaking speed of the events in Oakland? The sketchy record of the Oakland Police certainly deserves some credit, especially with the injured Olsen and the video footage showing an officer tossing a flash-bang grenade into a crowd of people trying to help him. And then there’s Mayor Jean Quan, who has also been a key if unwitting ally. Absent during the raid, she has attempted to explain her shifting positions with remarkable incoherence, and was recently booed when attempting to speak at a general assembly. At meetings of Occupy Oakland, many of the people I spoke with watched the unfolding occupation with sympathy—but just watched. It took the raid, the images of tear gas clouds and a bloodied Scott Olsen to get them into the streets. As Saul Alinsky wrote, all action is in the reaction. A former organizer, Quan will not soon forget that axiom. Organizers have taken the openings created by the city’s response and doubled down, using the anger over police behavior and growing distrust of Quan and channeled it back into the original targets of the Occupy movement. And let’s admit it: marches and rallies are tired tactics, at least when spent listening to official leaders mouthing approved lines while holding signs in which those approved lines are written. 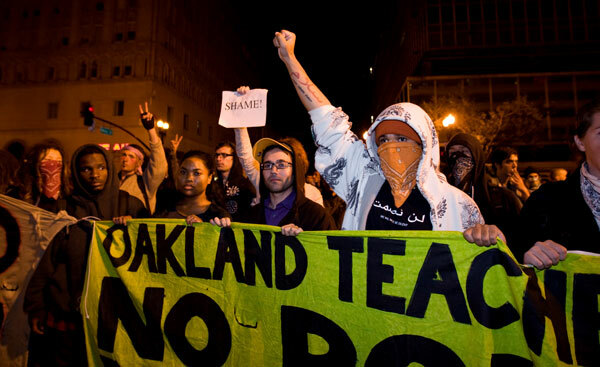 By calling for a general strike, Occupy Oakland has gone into the deep end of the left’s swimming pool, navigating imaginative and uncharted waters. That no one knows what will happen is a key source of motivation and excitement. We’re taught to dream big, but often when I’m shuffling along at a protest I feel those dreams shrinking to the size of the sign I’m holding, like a cog in someone else’s grand machine. In Oakland we are still cogs, but the machine belongs to us, and it’s moving in a direction that’s not entirely clear. They’re something liberating about an uncertain future. Of course, it’s easy to argue that calling for a general strike is foolish overreach. “It’s not possible to organize a general strike in one week,” said a member of the California Federation of Teachers during opening comments at the first strike-planning meeting. His was a reasonable statement. Even as Occupiers like to remind people that Oakland was the site of a general strike in 1946, it’s hard to imagine something similar happening today. Still, there have been numerous signs pointing towards November 2 as being a success, even if plenty of people still show up for work. Each day brings news of another union joining the cause. An organizer with Unite-Here, which represents restaurant workers, spoke of union members preparing a giant feast for strikers. The Executive Board of the Oakland Educational Association, whose 2700 members teach in the city’s schools, has endorsed the day of action, with teachers at one elementary school telling parents the school will be closed for the day. Meanwhile, SEIU Local 1021, which represents 1,750 city workers, has encouraged its members to take a leave of absence for the day and come to the protest. And for sympathetic workers unable or unwilling to strike, the plan is to assemble at Frank Ogawa Plaza at 5 pm and march to the Oakland Port, the fifth busiest in the country. Union contracts prevent longshoremen from striking, but a large picket line could prevent them from clocking in to their 7 pm shift, effectively shutting down all activity at the port. “This will show that not only are we the 99 percent but that they are not making any money without us,” explained Raymond “Boots” Riley, an organizer with Occupy Oakland and member of political hip-hop band The Coup. “Strong people don’t need strong leaders.” That statement fits into the ideology of the Occupy movement, but it comes from Ella Baker, a legendary Civil Rights organizer. As an advisor to the Student Non-Violent Coordinating Committee, or SNCC, Baker played a key role in encouraging the organization’s non-hierarchical orientation. Made up of young whites and blacks, SNCC would led a direct action movement of countertop sit-ins and then organize Freedom Summer, a voter registration project in Mississippi. Some older Civil Rights organizations disapproved such tactics. “We’re sitting this one out,” was NAACP’s message about Freedom Summer, fearing a backlash.